Horizontal stratification of air - cool air settles near crop levels and the hot air rises to escape through roof vents. In a standard pad and fan system, the temperature will be coolest near the pad wall and will heat up as it travels to the fans. While simple in concept, positive pressure cooling is actually an engineering challenge. Positive pressure cooling for the greenhouse is nothing new. As a matter of fact, it has been used for over forty years but its use has been limited to small areas and special applications. The engineering challenge is to make it effective in large areas for commercial growers. The main problem to overcome is the massive solar heat gain inside a greenhouse. Normally greenhouse cooling is achieved by moving large volumes of air. This solution conflicts with the main benefit of positive pressure cooling, restricting insect entry into the greenhouse environment. It is a catch 22 engineering problem. Good cooling requires moving large amounts of air. All that air brings many insects into the greenhouse. There are three basic greenhouse-cooling systems: positive pressure, negative pressure and natural ventilation. Negative pressure systems generally pull all the air out of a greenhouse once a minute with fans and pads located on opposite walls. Solar heat gain will cause the air temperature to rise as it travels from wall to wall. In some cases it may increase 20 degrees from pads to fans. And more insects are sucked in every minute. The best natural ventilation system is only capable of matching the outside temperature and then all roofs and walls are open to insect infestation. Positive pressure systems force cool air into the greenhouse. The new cool air settles to the ground. The old air is warmed from the sun as it rises. It exits the ridge vents hot and far away from the crops. 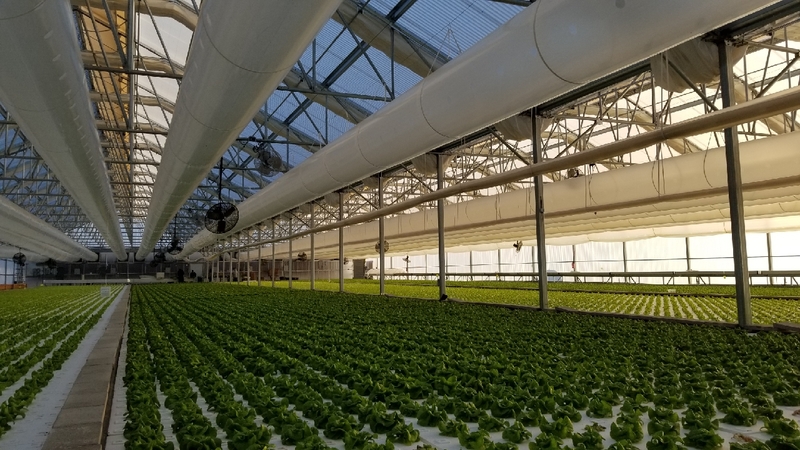 Agra Tech engineers have developed Agra Kool II, a system that overcomes the limitations of past positive pressure cooling systems making it a reliable cooling alternative for most growers. A steel covered frame is attached to one of the greenhouse walls. A standard cooling pad system is mounted to the outside. High volume jet-fans pull air through the pads and insect screens and force it into the greenhouse through special convection tubes. Integrated pressure sensitive ridge vents maintain pressure and allow heat to exit. At Agra Tech, we have been on the technological edge of developing positive pressure greenhouse cooling for two decades. No other greenhouse manufacturer knows more about the engineering headaches inherent with positive pressure systems than us. Growers have been relentless in their need for new and improved greenhouse cooling systems. So have we.